This year’s Chagford Show took place on Thursday 21st August and showcased a huge array of attractions, events, trade stands and food stalls. Naturally, a large outdoors event like this combined with the unpredictable English weather called for the help of some form of marquee cover, and that is where we came in. Having worked with the organisers of The Chagford Show for a number of years, they knew that we could provide a variety of different marquees to suit the different stalls and event stands involved within the show. As luck would have it, the sun shone all day long providing this fantastic agricultural event with a great day out for all the family. 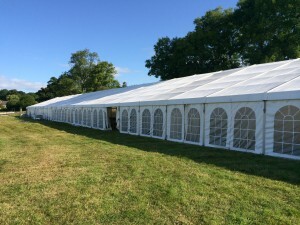 We have also provided marquees for a variety of similar events over the summer, including the Holsworthy & Stratton Agricultural Show and the Okehampton Show, proving that we know what we are doing when it comes to providing marquees for outdoor shows and events, whatever the size or weather conditions.